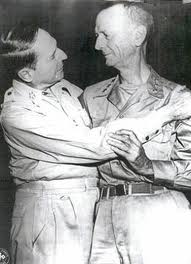 After General Douglas MacArthur, over his fiery objections, was ordered to leave Bataan during the Japanese conquest of the Philippines, Lieutenant General Jonathan Wainwright was left in command, putting up a heroic fight until forced to surrender his starving, diseased ridden force. Wainwright was the only American general to be captured by the Japanese and he endured the hell on earth that was Japanese prison camps, where some 37% of Allied prisoners died of starvation and the brutality of their captors. Wainwright insisted on sharing the privation of his men, and risked his life many times to intervene on behalf of his fellow prisoners with their captors. After he was liberated, he was a walking skeleton. Douglas MacArthur gave him the signal honor of featuring prominently in the surrender ceremony by which Imperial Japan capitulated. As we prepare for Thanksgiving tomorrow, and as we recall our blessings and thank God for each and every one, let us also remember the humble turkey and the various disasters that result when that proud bird is not treated with the care that it deserves, dead or alive. Oldtimers like myself will recognize the above video as part of the famous “Turkey Drop” episode from WKRP, a sitcom from the Seventies. Of course Turkey Disasters are not, unfortunately, restricted to the realm of fiction. Deep frying a turkey poses various risks. We must never cease to proclaim in fearless tones the great principles of freedom and the rights of man which are the joint inheritance of the English-speaking world and which through Magna Carta, the Bill of Rights, the Habeas Corpus, trial by jury, and the English common law find their most famous expression in the American Declaration of Independence. No American will think it wrong of me if I proclaim that to have the United States at our side was to me the greatest joy. I could not foretell the course of events. I do not pretend to have measured accurately the martial might of Japan, but now at this very moment I knew the United States was in the war, up to the neck and in to the death. So we had won after all! Yes, after Dunkirk; after the fall of France; after the horrible episode of Oran; after the threat of invasion, when, apart from the Air and the Navy, we were an almost unarmed people; after the deadly struggle of the U-boat war — the first Battle of the Atlantic, gained by a hand’s breadth; after seventeen months of lonely fighting and nineteen months of my responsibility in dire stress, we had won the war. England would live; Britain would live; the Commonwealth of Nations and the Empire would live. How long the war would last or in what fashion it would end, no man could tell, nor did I at this moment care. Once again in our long Island history we should emerge, however mauled or mutilated, safe and victorious. We should not be wiped out. Our history would not come to an end. We might not even have to die as individuals. Hitler’s fate was sealed. Mussolini’s fate was sealed. As for the Japanese, they would be ground to powder. All the rest was merely the proper application of overwhelming force. The British Empire, the Soviet Union, and now the United States, bound together with every scrap of their life and strength, were, according to my lights, twice or even thrice the force of their antagonists. No doubt it would take a long time. I expected terrible forfeits in the East; but all this would be merely a passing phase. United we could subdue everybody else in the world. Many disasters, immeasurable cost and tribulation lay ahead, but there was no more doubt about the end. 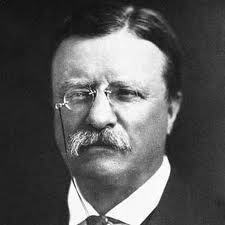 A frequent reader of the Bible, Roosevelt once opined that a thorough knowledge of it was more valuable to a person than a college education. Something for the weekend. The weekend before Thanksgiving seems appropriate for Turkey in the Straw, an American folk song which dates from the 1820s. The few weeks which have elapsed since your adjournment have brought us so near the close of the year that we are now able to sum up its general results. The retrospect is such as should fill the hearts of our people with gratitude to Providence for His kind interposition in their behalf. Abundant yields have rewarded the labor of the agriculturist, whilst the manufacturing industry of the Confederate States was never so prosperous as now. The necessities of the times have called into existence new branches of manufactures, and given a fresh impulse to the activity of those heretofore in operation. The means of the Confederate States for manufacturing the necessaries and comforts of life within themselves increase as the conflict continues, and we are gradually becoming independent of the rest of the world for the supply of such military stores and munitions as are indispensable for war. The operations of the army soon to be partially interrupted by the approaching winter have afforded a protection to the country, and shed a lustre upon its arms through the trying vicissitudes of more than one arduous campaign, which entitle our brave volunteers to our praise and our gratitude. We live in an age where scoffing at religion and believers in God is all the rage. In some ways the Eighteenth Century was like this time period. 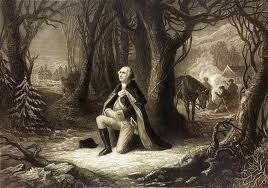 In the Age of Enlightenment more than a few people scoffed at Christianity and some openly embraced atheism. It was considered witty and daring and fun by the avant garde, especially in Europe. It seemed much less humorous at the tail end of the century when the French Revolutionary regime for a time persecuted Christians and slaughtered them for their faith. This type of hostility was much less in evidence in Eighteenth Century America. Even those, for example Thomas Jefferson, who had doubts about the divinity of Christ, praised His teachings and had no doubt as to the existence of God.